Q: Why did you pick the plight of migrant workers in China as the subject of your first film? Has this issue touched your own life in some way? A: I was born to an average family. My father was a college professor and my mother was an accountant. I went to university in my hometown, so I never actually had a personal experience of migrating. Back in the days at CCTV when I travelled, I was constantly consternated and often grieved by the shocking poverty and misery across the country’s vast rural land, submerged under the glamour of the modern metropolis. I started to realize that the country’s millions of migrants, the very contributors to today’s prosperity, were denied many basic social necessities. They have to bear this great grief of constant separation from their loved ones. I decided I had to make a film to document this unique group against the backdrop of a changing country. Q: How did you find your subjects? Was it hard to convince the family to be on camera? 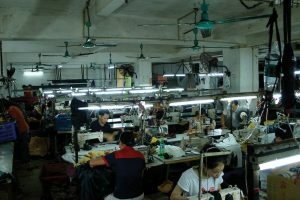 A: In the city of Guangzhou I visited over 30 factories. They make everything there: toys, garments, electronics, you name it. I just strolled around these factory neighbourhoods and talked to the workers I met. They are generally nice but also cautious about speaking to strangers. In an ever-shifting population of migrants, mutual trust takes time to gain. I eventually met the Zhang couple. In the beginning, they were cautious about discussing their family lives, but I revisited them many times in the following weeks and we became friends. Eventually they agreed to the shooting. I felt very lucky to know them and was most grateful for their kindness and openness with me and the crew. They were so generous to let us enter every part of their lives for years. Our friendship grew as time went by. The crew call the man “brother Zhang” and his wife “sister Chen”. We were like one big family, trudging through factory life. Q: Were you ever tempted to put down the camera and help the Zhangs resolve the difficult issues that were happening right in front of your eyes? A: I guess this is the ultimate question that every documentary filmmaker faces at some point. The choice is always difficult. Like I said, one reason I wanted to make this film was to raise awareness and better the lives of Chinese peasants. There will be moments when an individual’s well-being is challenged in the process. For example, when the father hit the girl, should I have put down the camera or should I have captured this emotional moment to give the film a stronger narrative to reach a larger audience and eventually create changes? In such a conflict of ethics versus professionalism, everyone is challenged to make a sensible decision. I would choose the greater good but, very importantly, not at the cost of harm. The moment the father hit the daughter, I was in another room, my cameraman was shooting. I heard the shouting and came to the scene, and went into the frame to calm everyone down. The Chinese believe the world we live in is not a world of black and white. As the Tao’s yin and yang argument explains: every action creates a counter action as a natural, unavoidable movement. Also, as the Taoijitu sign shows, there is black in white, and there is also white in black. Q: Why do you think China has this massive migrant community? A: The migration of the peasant work force started in the early 80’s when the country first opened its economy. The influx of foreign investment created numerous factory towns in the southern coastal regions. A soaring demand for labour lured millions out of their farmland to work in factories. Also with the loosening of the country’s long-standing household registration system, people started to move around to find opportunities to better their lives. A low wage and lack of rights prevents them from bringing their families from the villages to the cities, even after decades of work. Q: What region have most workers gone to, and from where have they come? A: The general trend of migration is from the undeveloped western part of the country toward the more developed eastern and southern coastal areas. People from densely populated provinces such as Henan, Sichuan, Hubei and Hunan tend to leave their homes to find work in big cities across the country. Q: Do you think the transportation system in China can be improved, and how? A: Improving the country’s overall transportation system is on Beijing’s priority list. That being said, the Spring Festival problem is more related to social policies than the transportation system. The fact is, no matter how many roads you build, it’s just impossible to transport such a large amount of passengers all at once in one direction. A more rational solution is the implementation of labour law, granting the migrant workers the social care and support they deserve, allowing their families to move to the cities. China has set a goal to urbanize half of its 1.3 billion population by 2020, and 70% by 2050. Q: What do you think of cross-generation care (i.e. grandparents caring for grand kids)? How does this trend impact the new generation? A: Grandparents tend to spoil little children because nowadays most families have only one child. Because these kids are less disciplined on their grandparents’ watch, they became what we call “little emperors”. It’s a good and bad thing. The new generation definitely have more freedom to think and do what they want, which may translate into a positive force to change the country. On the other hand, these spoiled little emperors and empresses often bear discouraging qualities like a lack of strong will, being inconsiderate to others, and the like.